The Procure-to-Pay (Req-to-Check) Suite includes five modules that can be used individually or as an integrated solution to automate your entire Procurement process. SpendMap can automate and streamline many time-consuming Purchase Order management tasks, such as PO creation and status tracking, Change Order management, supplier and item catalog maintenance, spend analysis reporting, etc. SpendMap will help you eliminate paperwork, save time and increase visibility in your Purchasing Department. Automatically build Purchase Orders from approved Requisitions or RFQs. Create POs from scratch (no Req or RFQ) when needed. Copy a previous order or a PO Templates to save time. Send POs to your suppliers by auto-fax and email or push orders directly into your suppliers’ web-based order entry systems using PunchOut integration. Learn more here. Change Order management, including revision numbering, field-by-field tracking, and the ability to reprint any version of the order at any time. Late order tracking and expediting. SpendMap supports a self-service environment where your staff can easily order the products and services that they need while maintaining full control over who buys what. Requisitions are routed for online approval based on your business rules (workflow) before anything is ordered. Approvers are notified by email and can approve or reject Requisitions right from the body of the email notification itself, or they can log in to SpendMap on their PCs, tablets or phones to complete the approval process. If you’re using paper, Excel or email for your approval process, this efficient online system will significantly reduce costs and accelerate the requisitioning process by days. And if you’re currently waiting for your suppliers’ invoices to show up before the approval process begins, SpendMap can help you make the shift to pre-purchase approval to control spending at the source and gain visibility into your spending much earlier in the procurement process. Easy-to-use Shopping Cart (store front) simplifies Requisition creation with little or no training for casual/occasional users. Staff can select pre-approved items from your internal Item Catalogs or they can PunchOut to leading supplier websites like Staples and Amazon to pick their items. Requisitions update budgets immediately, before orders are placed with suppliers, rather than weeks later when the invoice shows up. Instantly route new orders to the right managers for online approval based on business rules in the system (automatic workflow). Automatic email notification to Approvers who can approve/reject right from the body of the email. Enter new Requisitions and approve orders on your smartphone or tablet while out of the office. Flip approved Requisitions into Purchase Orders or RFQs with no additional data entry or route to the Stock Room to be filled from your internal inventory. When goods or services are delivered, you can record receipts in SpendMap to update all applicable areas of the system, such as the status of the Purchase Order, the supplier’s delivery performance, item history, and so on. Receiving also updates other modules of SpendMap as well, for example, increasing stock levels in the Inventory Control and Asset Management Modules. Receiving will also create an “accrual” to match the supplier’s invoice to for payment approval, in the Invoice Approval Module. Receivers no longer have to send paper Packing Slips around your company since the folks in Purchasing, Accounts Payable and other departments can access receipt information in SpendMap to do their work. The Receiving Module eliminates bottlenecks and lost documents while reducing the administrative burden of paper files. Supports both central and end-user receiving. Integrated Barcode Module simplifies receipt transactions. Receipt history and late PO reporting. Export receipt data to other systems if needed. In far too many organizations, the invoice approval process and reconciliation within the Accounts Payable department is the most laborious, time-consuming and error-prone step of the procurement cycle. SpendMap complements your current Accounting or ERP system by replacing a cumbersome, paper-based invoice approval process with an efficient online system. You can quickly and easily approve your suppliers’ invoices for payment, both Purchase Order related invoices as well as non-PO invoices. Once approved, invoices can be exported to your Accounts Payable system using the built-in A/P Interface. With SpendMap’s invoice approval module, you will immediately increase control over payments, reduce data entry and document management costs and accelerate the invoice approval process by days. Two and three-way invoice matching for easy approval of PO-related invoices. Support for non-PO invoices (e.g. rent, utilities, etc.). Export approved invoices to your Accounts Payable system using built-in AP Interface. Add freight and other charges at invoice approval stage, without having to modify the PO. Route invoice discrepancies for additional approvals, if necessary. Split-charge invoices to multiple account codes. 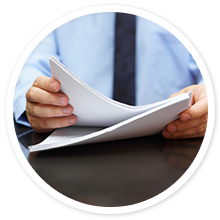 Detailed reporting, including Accrual and Invoice Aging reports. The Request For Quotation Module facilitates the creation of your RFQ documents, the management of your supplier bids/quotations, and the automatic creation of Purchase Orders or Requisitions from selected bids, with no duplicate data entry. The current status of any RFQ is instantly available, as is complete RFQ and bid history. With the RFQ module, you can eliminate data entry, streamline the bidding process and reduce prices for the goods and services that are needed to keep your business running. Automatically build RFQs from approved Requisitions, with no duplicate data entry. Unlimited items and suppliers per RFQ. Print, fax or email RFQs to your suppliers or post new RFQs to SpendMap’s web-based Vendor Portal where suppliers can review their RFQs and submit their pricing online. Award entire RFQ to a single supplier or split RFQs between multiple suppliers. Automatically build Purchase Orders or Requisitions from awarded RFQs with no duplicate data entry.